To see if Darin A. Latimore is accepting new patients, or for assistance finding a UC Davis doctor, please call 800-2-UCDAVIS (800-282-3284). 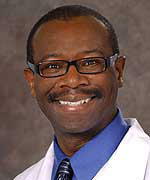 Dr. Latimore is the Associate Dean for Student and Resident Diversity at the UC Davis School of Medicine. The vision of the Office of Student and Resident Diversity is to create an environment where individuals from diverse backgrounds feel included and respected, produce a physician workforce that reflects the diversity of the state of California, and achieve educational and clinical standards of cultural competence that ultimately will reduce health disparities and provide the best care for all patients. J. .E. Shindelman, R. T. Dworschask, D. B. Rosman, R. J. Rovito, D. S. Lingenfelter, D. A. Latimore and P. L Khanna. CEBIA Folic Acid. A Homogenous Enzyme-Based Lingand Binding Assay. J. Clin. Immunoassay 1989;12(1):56.